It's been pretty quiet around here. It is almost the end of April yet I haven't written any entry for this month. I tried my best to keep mum about this trip because I wanted it to be an escape of some sort... to get away from it all even for just a couple of days. So I flew to Oz with my good friend Joy, who also wanted some quiet time away from the hustle and bustle of Manila. We planned the trip several months ago because we've been wanting to visit our dear Kaymee. I was hesitant at first because it's not easy to get an Australian visa, but I just had to try. I submitted my documents late last year through the Immi website and I received my visa grant the following day. I stashed up some cash to pay for my plane ticket before I made the booking. It was a hefty sum of money, but since it's a childhood dream to see Australia, I gave it a go. I also wanted to make the most out of my visa grant so I decided to book a multi-city ticket from Taipei to Melbourne and Sydney. After 8 hours, we landed in Melbourne. Following Kaymee's instructions, Joy and I took the Skybus from the airport to the Southern Cross Station where Kayms will be waiting for us. We then met a crying-Kaymee, and we kissed and hugged for several minutes until it dawned on us that we're all finally together (except for our friend Dhi who was arriving the day after) in one same place- no Skype, no Viber, no Facetime. I was no longer "virtually together" with the girls I love the most. 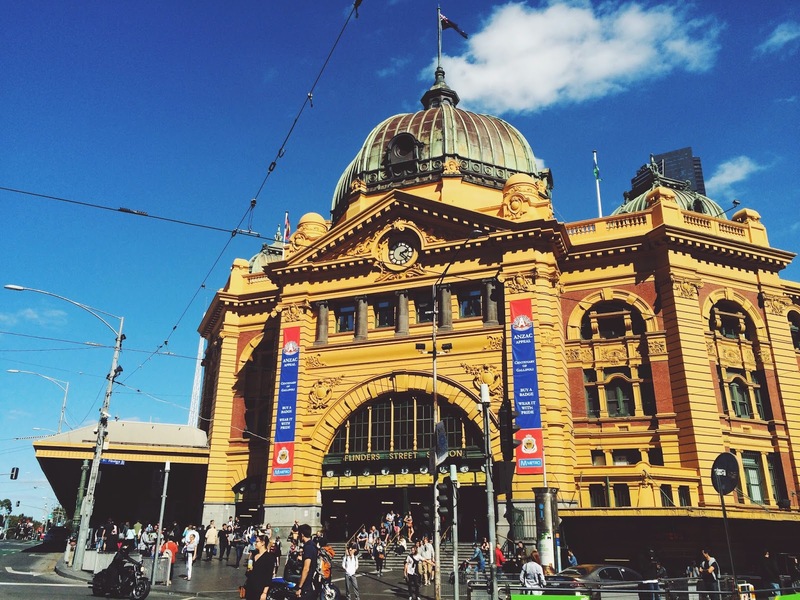 For four days, we explored and marveled at the beauty of Melbourne, inhaled the wonderful aroma of the city's coffee culture, drank copious amounts of flat whites and chai lattes, put our worries behind, and just enjoyed each other's company. 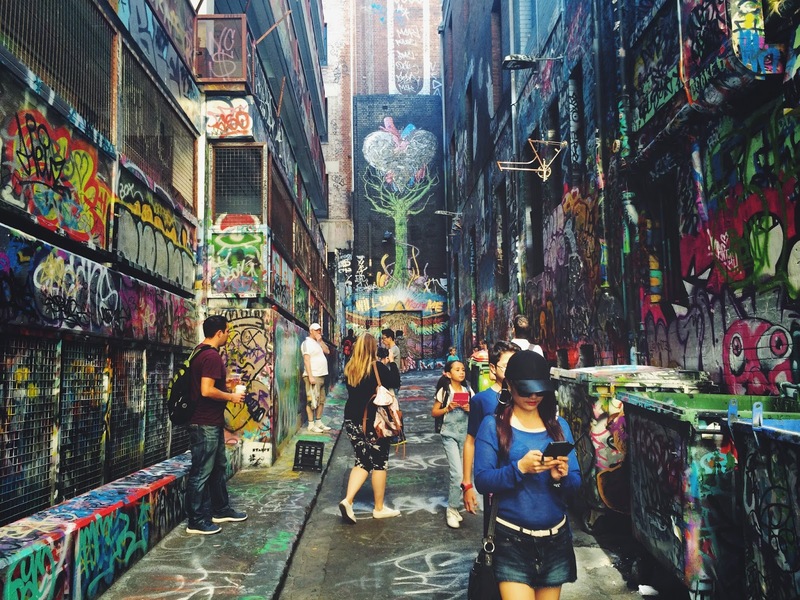 Wandering off Melbourne's grid of streets, you'll find sweet little surprises tucked in hidden alleys. After alighting one of Melbourne's iconic city circle trams, Kaymee took us for a walk downtown and brought us to Degraves Street. We had brunch at The Hardware Societe on Hardware Street and spent the rest of the afternoon clicking our shutters away at Hosier Lane, where graffiti murals offer a vibrant feast for the eyes. We then sat on the grass at a park along the Yarra River, rested and talked about our lives. I'm extremely blessed to have found such wonderful friends in Kaymee and Joy. We've seen each other both in good times and in bad. We've laughed at silly jokes and cried at every tribulation. I'm also very happy to see how well Kaymee is doing over there, especially now that she found Mori (and that Mori found her). I only made two specific requests to Kaymee for this trip- to see Brighton Beach and the Twelve Apostles on Great Ocean Road. I'm so glad she granted these wishes, and I'm also thankful to Joy because she agreed on visiting these places again even if she had seen them before. Brighton Beach is famous for its colorful bathing boxes (their version of beach cottages). The bathing boxes, 82 of them in total, are among the main tourist attractions in Melbourne. We laid a mat and sat by one of them, with chips and drinks in hand, while watching the sunset. The breeze was cold but we felt some comforting warmth from the sun as it set ablaze. It was perfect... just the way I imagined this dream trip to be. We rented a car and together with Kaymee's uni friends, we drove to the Great Ocean Road. Is there a word even greater than 'great'? Because the adjective does not do justice. I had goosebumps when I saw the Twelve Apostles up close. The Twelve Apostles are not really 12. I counted around 7 or 8 rock stacks that were formed by erosion from the Southern Ocean. At some point, I just had to close my eyes to feel the moment and thank God for everything in my life. It was more than my heart can take. I kept telling Joy everything is just so surreal. I could almost see Joy's face lit up. It was quite timely because our visit fell on Holy Saturday, day before Easter. With the immensely beautiful view all throughout our road trip, I was lullabied by God's voice and His presence in all the beauty my eyes had witnessed. Those hidden alleys are beautiful so artsy! And as always your pictures are beautiful. I hope you had a great trip. I remember your story about getting the Aussie visa. I asked my dad about it and was told I really did have to wait three weeks. My heart sank. Well, I've been planning to go to Sydney for years now. Would've two years ago but then life said no, and now I have a girlfriend. I don't blame her at all. Wow!!! What a wonderful trip Jackie! You're truly blessed. I love all your photos. The graffiti wall and the beach are both amazing. It's marvelous indeed! The beach is stunning. I'd want to go visit this place someday. waaahhh!! SYDNEY maybe one day too I'll visit them. Thanks for sharing your beautiful story! Also, I love your pictures. May I ask what camera are you using? Thank you Rea and Lux G.
Your photos are so beautiful and your blog made me salivate that I wanted to apply for Australian visa. I've been dreaming of seeing Australia and New Zealand too. They both seem laid-back, untouched and unpolluted. Thanks for sharing! Thank you! Thanks too for dropping by my site!